mezzo-soprano Sarah Maines is equally at home on the operatic stage or behind a microphone. She is a member of the Portland Opera Chorus and a frequent performer with Portland companies such as Broadway Rose, Lakewood Theatre, Mock's Crest Opera, Fear No Music, and Resonance Ensemble. In a review of the Mock's Crest production of HMS Pinafore, Oregon Arts Watch reviewer Bruce Browne stated that "Cousin Hebe (Sarah Maines) was of a different stripe: lovely voice combined with convincing acting." Additional favorite performances include Maurya in Riders to the Sea, Gershwin’s Summertime with international trumpet star Jens Lindemann, and the premier of the cabaret song "Call Anita" by contemporary composer Richard Pearson Thomas. Dr. Maines currently teaches at THE MAINESTUDIO as well as the University of Portland. She moved to Portland, Oregon from Northern Virginia, where she taught hundreds of students at Patrick Henry College, the Shenandoah Conservatory Arts Academy, and Trinity College of Washington. Her students regularly win awards and scholarships, are cast in leading roles, and perform professionally, some with prestigious organizations such as Nation Broadcasting and the Thailand National Symphony Orchestra. After completing her Bachelor of Arts degree in Voice Performance from Berea College, she earned her Doctorate of Musical Arts and Master of Music degrees in Voice Pedagogy at Shenandoah Conservatory. She was mentored by acclaimed teacher and Van Lawrence Award recipient Dr. Janette Ogg throughout her graduate degrees. Her extensive study of pedagogy (the art and science of teaching) equipped her with an enormous teaching tool-bag founded in specialized knowledge of voice anatomy and function, acoustics and voice science, and multiple teaching methodologies. She is experienced with teaching classical and musical theatre repertoire, and is certified in the Contemporary Commercial Music, Music Theatre Pedagogy Institute with Jeanette LoVetri (Watch a video about the CCM Institute here). Dr. Maines is an active National Association of Teachers of Singing (NATS) member, currently serving as the Cascade NATS Chapter President. Dr. Maines guides disordered vocalists back to healthy, free singing. Previously practicing with Dr. Christopher Chang of the Virginia Voice and Speech Center, she is now accepting referrals from the OHSU Voice Clinic, and laryngologist Dr. James Thomas of voicedoctor.net in Portland, Oregon. 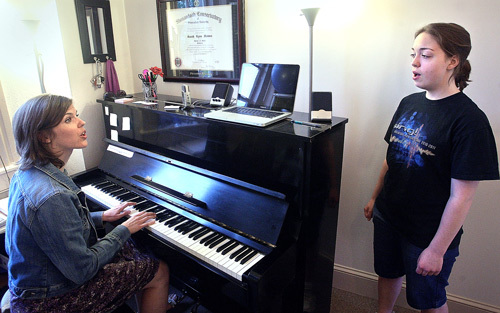 She holds a DMA in voice pedagogy from Shenandoah Conservatory and completed specialized training with Dr. Wendy LeBorgne of the Blaine Block Institute for Voice Analysis and Rehabilitation and Tom Cleveland of the Vanderbilt Voice Center. Dr. Maines is certified in Lessac Madsen Resonant Voice Therapy Basic Adult and Advanced Adult as well as Casper-Stone Confidential Flow Therapy, as instructed by Dr. Katherine Verdolini Abbott of MultiVoiceDimensions. She is an active member of VASTA. Dr. Maines trained with researchers such as internationally acclaimed Swedish voice specialist Dr. Johan Sundberg, and Van Lawrence Award recipient Dr. David Meyer. She is particularly interested in voice therapy as it relates to efficiency. A frequent lecturer, she most recently joined the faculty at Pacific University for Optimizing Care Across the Gender Spectrum where she presented on voice pedagogy practices for the transgender population. Previous presentations include the Pan-European Voice Conference in Prague, where she was selected to present her research on voice therapy and efficiency for musical theatre singers and co-teach a workshop on interdisciplinary voice pedagogy curriculum development.